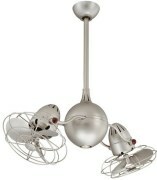 We've hand picked only the highest quality, design forward ceiling fans to offer to you to outfit your home or office. Today's ceiling fans offer cool style elements, energy efficient motors, and LED light sources to give you both function and style. 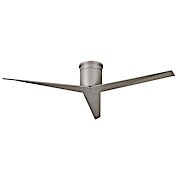 We have small ceiling fans for the kitchen or mudroom to large industrial ceiling fans. 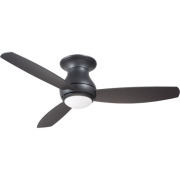 We offer the best manufacturers such as Fanimation, Emerson Fans, Modern Fan and Matthews Fan Company. Ceiling fans are a wonderful way to add an energy efficient way to cool your home, a light source, and style! Running an AC unit uses about 2500 watts of energy versus a ceiling fan which uses only about 65 watts of energy. Fans help circulate the air, allowing you to use less air conditioning. Some homeowners have even seen a reduced bill annually of $500. It's also helpful to remember that ceiling fans are not just for summer usage. Heat rises in the winter, and ceiling fans help push hot air down. For an extra boost in energy saving, look for energy efficient fans or DC motor fans which will require less energy to run. Many homes also rely on the ceiling fan for a light source for the room it occupies. Ceiling fans with lights do double duty to provide energy efficient cool air and illumination for your room. 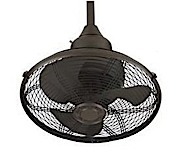 Many of today's fans offer LED light sources which are more energy efficient. 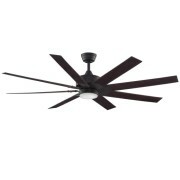 A ceiling fans with remote or wall control makes changing the fan settings a breeze. Some remotes even have the reverse switch on the remote to make it easier to switch the direction of the fan for the winter. If a fan is listed without a remote or wall control, make sure to inquire from us and one is usually always available as an addition. Ceiling fans are more than ever a great way to express your style. The variety of colors and styles is more than ever before. 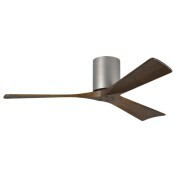 Several years ago, a fan might only be offered in bronze, white, and brushed nickel. Today, the color choices including things like driftwood, matte greige, black, etc. 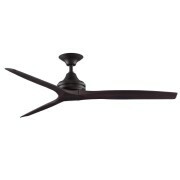 We have seen a black ceiling fan becoming a very popular choice for people who might have had to settle for oil rubbed bronze in the past. A white ceiling fan is perfect to blend into the ceiling. 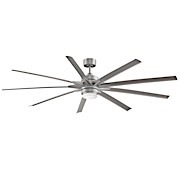 From modern ceiling fans, tropical ceiling fans, industrial ceiling fans to rustic ceiling fans, whatever your style is, you can find the fan to match your decor! 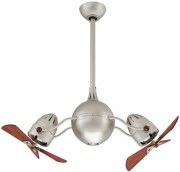 Tropical ceiling fans are especially popular for beach inspired decor homes, lake homes or those in tropical areas. These have palm or bamboo inspired blades to feel like island fronds are cooling you in style!